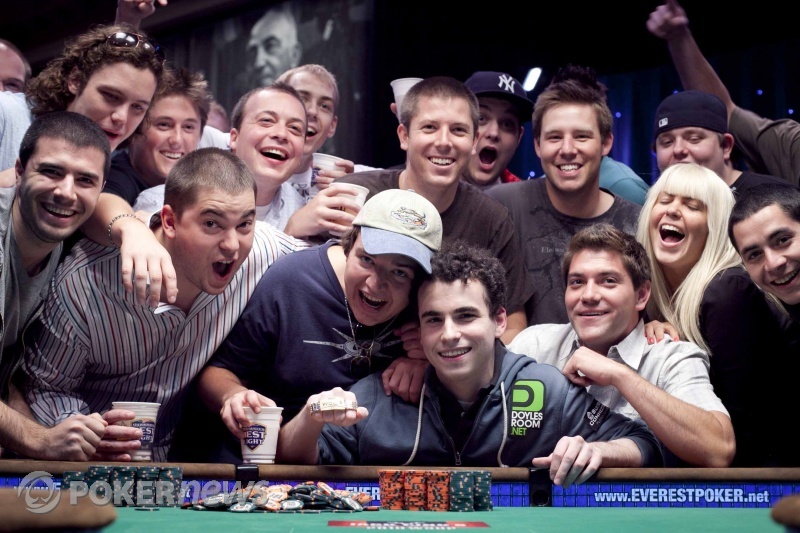 One of the most prestigious events at the 2010 World Series of Poker has just come to a thrilling conclusion in front of a packed house of spectators here inside the Amazon Room. The $25,000 Six-Handed No-Limit Hold'em event brought 191 of the world's most talented players together to battle for serious bragging rights and a top prize of more than $1.3 million. After three days, the final six of them had one full night to try and accumulate some sleep for today's potentially life-changing final table. When they reconvened this afternoon around the final table, it took a bit more than three levels of poker to knock out five players, and we've managed to crown our champion before the dinner break. Dan Kelly, a 21-year-old student from Potomac, Maryland has successfully completed his quest to collect every chip on the table, all 14+ million of them. Kelly, who plays online under the monikers "djk123" and "imabigkidnow", came into the day with a commanding chip lead, and he held it nearly wire-to-wire to close things out. At stake for the young standout was that handsome cash prize as well as a lucrative and enviable sponsorship deal with a prominent online poker site. Kelly's game plan today was apparent right from the moment he sat down in front of his five competitors. He was active and aggressive, and his chip stack continued to swell as the first few players fell by the wayside. First to drop was Eugene Katchalov, followed shortly by Mikael Thuritz and Jason Somerville, and that put us three-handed for the title in short order. At that point, Frank Kassela was still in the hunt for a remarkable third bracelet of the Series, but his run at that feat came crashing to a halt courtesy of an eight-out rivering that sent him to the cashier's desk in 3rd place. That left Kelly heads up with Shawn Buchanan with the latter holding a slight chip edge as the duel began. Kelly worked quickly to erase that deficit, though, and the big bets being fired from both ends of the table made it apparent that the match would not last long. With more than three-quarters of the chips in play in the final pot of the day, Kelly managed to find a three-out ace on the river to eliminate Buchanan as the runner up and put the bracelet around his own wrist. The cash reward for Kelly's show is officially $1,315,518, but this win is worth a lot more than that to him. 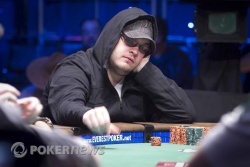 Kelly has absolutely cemented his position as one of the premier young players in the game, and this new boost to his bankroll and his credibility ensures that we'll see him around the corridors of the WSOP for a long time coming. So then, enormous congratulations go out to Dan Kelly for his triumph in Event #52; this has been one to remember. The Action, The Drama, the Aftermath. Dan Kelly opened for 200,000 from the button, Shawn Buchanan raised to 650,000, and Kelly four-bet to 1,425,000. After asking how much Kelly had behind, Buchanan moved all-in and Kelly made the call. Kelly had Buchanan covered. The entire audience was on their feet as the flop came down , Buchanan's jacks still leading. The on the turn brought some outs to a chop, but that was not how this hand would end. The dealer burned and turned the and hundreds of jaws dropped to the floor as the room erupted. 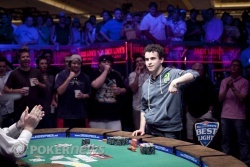 Buchanan was eliminated and the WSOP crowned their newest 21-year-old bracelet winner, Dan Kelly! Although he lost out on the bracelet, Shawn Buchanan made his largest-ever career cash in this event, earning $812,941. Buchanan turned top two, but that river seven gave Kelly the winning trips and the chip lead once again. Dan Kelly raised to 175,000, and Shawn Buchanan called for a flop. It came , and Buchanan led out with 225,000. Kelly called, and Buchanan checked to him on the turn. 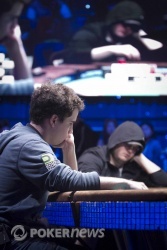 Kelly took his cue to bet 435,000 and that ended the hand right there. Shawn Buchanan completed the small blind and Frank Kassela checked his option in the big blind. The flop came down . Buchanan checked to Kassela, who bet 80,000. Buchanan raised to 260,000 and Kassela came back over the top for 710,000. Buchanan called. The turn came the and Buchanan checked again. 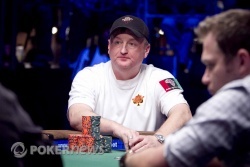 Kassela bet 1,000,000, Buchanan moved all-in and Kassela made the call! With 7,280,000 in the pot, the cards went on their backs. Kassela sprung back like he'd been electrocuted when he laid his eyes on Buchanan's hand- an open-ended straight draw against his two pair. The entire audience rose to their feet as the dealer burned and turned the river. It was the . Kassela threw his hands up in the air as Buchanan made his straight. So much for being an 82% favorite with one to come. Buchanan's fans erupted in cheers, although their man hardly moved a muscle as the massive pot was shipped his way, and Kassela exited the stage in third place. With his finish today, Kassela has 285 points in the WSOP Player of the Year race, 60 points ahead of second-place John Juanda, and is a near-lock to win POY honors. We're on a brief pause while the stacks are counted up and the table is prepared for heads-up play. Dan Kelly with friends after his win! The Ace hits on the river! Waiting for the river card!